If you have dark circles under your eyes, this doesn't mean that all those nights out on the town have finally caught up with you. Mayo Clinic experts state that dark eye circles aren't caused by fatigue, but they are often simply the result of shadows cast by puffy upper eyelids as well as hollows that form as you age. In some cases, the most effective treatment that a dermatologist may mention is blepharoplasty, a plastic surgical procedure to remove eye bags. Dark circles around the eyes, as well as eye bags and puffy eyelids, can be caused by a number of factors other than the intrinsic aging process, says the Mayo Clinic. Allergies and nasal congestion, atopic dermatitis, pigmentation irregularities, sun exposure, smoking, and drinking alcohol and caffeinated beverages can be the cause of dark, shadowy eyes. But sometimes it's simply a matter of genetics, and dark circles are passed down from one family member to another. Dark eye circles aren't usually a cause for medical alarm, says the Mayo Clinic, but they can make you look haggard and tired. Certain cosmetic treatments used to address signs of photoaging, such as wrinkles and age spots, may be used to reduce the appearance of dark eye circles, says Mayo Clinic experts. A dermatologist may use a laser or light-based device to address under-eye circles, says the American Academy of Dermatology, an outpatient procedure that can be done in under an hour. Improvement may not be noted right away, and to get the best results, multiple treatments may be needed (anywhere between three and six sessions). It might not be the right treatment for everyone; the AAD cautions that laser and light treatments do not yield the same results as a surgical procedure. The Mayo Clinic cites a chemical peel as another cosmetic treatment that may be used to rejuvenate the skin, making dark eye circles less obvious. The AAD indicates that a chemical peel can be used to reduce fine lines under the eyes, but it may also be used to smooth away lines that linger after a laser treatment so that the area where the laser stopped isn't as noticeable. The effects of a chemical peel are unlikely to be permanent, and certain post-treatment care must be exercised, which includes using adequate sun protection and avoiding exposure to the sun. The AAD stresses that after a chemical peel, a dermatologist's instructions for post-treatment care must be followed down to the letter to avoid infection and scarring. 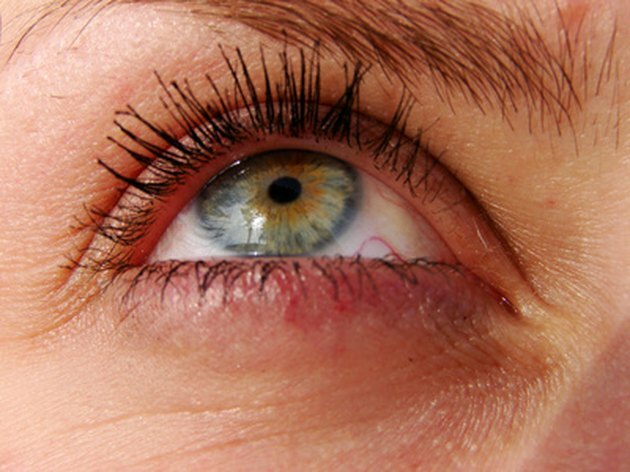 The aging process causes eyelids to stretch; the supporting muscles loose their strength. Excess fat can migrate either above or below the eyelids, resulting in baggy eyes, as well as drooping eyebrows and upper eyelids. Eyelid surgery, or blepharoplasty, is an outpatient procedure performed under anesthesia by a cosmetic surgeon to remove the excess fat, muscle and skin. The Mayo Clinic states that the results of eyelid surgery–a more alert, rested appearance–can last a lifetime, although others will notice subsequent eyelid drooping. The treatment for dark circles around the eyes depends on the underlying cause. Sometimes the cure may be as simple as treating allergies more effectively, sleeping with your head raised at night (to prevent fluid from pooling under your eyes) or getting additional sleep. The Mayo Clinic sites one study indicating that an eye cream containing vitamins C, K and E and retinol had moderate effects in reducing dark eye circles. A dermatologist or plastic surgeon can help you find the most appropriate cosmetic treatment. However, Mayo Clinic experts indicate that if you experience puffiness and discoloration in only one eye, or if symptoms appear to be getting worse, consult with your general practitioner. What Causes Wrinkles Under the Eyes of Youth?